Note: This is Lesson 15 of our Free Email Feeds & Speeds Master Class. Click here to learn more about the Master Class. Makino says micro-milling involves features smaller than about 0.001″ (what they actually say is smaller than 0.00098″). 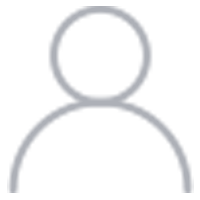 A little more common definition says it involves cutters smaller than 0.015″ in diameter and tolerances measured in tenths. Either way, these are very small numbers. What sorts of things require this tiny work? – Microfluidics, where tiny channels for the fluids are machined. – Microwaves, where the frequencies are so high that signals travel in tiny waveguides rather than through wires. These waveguides are often micromachined. – Fiber Optics, which involve precise use of lasers and focusing of light to very tight tolerances. – Medical Components, which often require tiny screws and other devices. – Semiconductor and Electronics, where miniaturization and even nanoscale technologies become the norm. All these and many more applications require the use of micromachining techniques. Micro-endmills live in a different world than most of our cutters are used to. The feeds and speeds formulas and calculations that work reasonably well for larger cutters need quite a bit of adjustment for smaller cutters to account for these changing conditions. Big Kaiser suggests these changes in cutting physics start to set in with tool diameters of 0.100″ or less. That’s larger than a lot of folks expect, and it’s larger than we normally think of as micromachining. What kinds of changes happen at these scales? Two chip loads: Top one has chip thickness > tool edge radius. Bottom one has chip thickness < tool edge radius and therefore is showing negative rake. It’s also more likely to plough or rub at these scales. The principal distinction between Macro and Micro-Machining operations emerges and manifests itself as the dominance of ploughing and rubbing phenomena at the cutting edge over shearing and the necessity to take micro-structural effects into consideration. Once feed-per-tooth is on the order of the cutting edge radius of the tool, macroscale rake angle is irrelevant. For really small cutters, the cutting force is twice what conventional calculations suggest it should be and chip load must be matched even more closely to manufacturer’s recommendations to prevent rubbing. 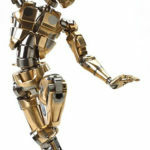 In fact, the cutting forces can be even worse, and research from The Association for Manufacturing Technology finds it as high as 10-20 times what conventional machining models would predict. With micromachining there is a pronounced minimum chip thickness that must be observed if the machining operation is to be successful. Below that thickness, chips simply do not form. In fact, most micro-milling involves a relationship between chip thickness (chip load per tooth) and cutting edge radius that is marginal. Often, a chip is not formed by every revolution. In other words, chips are formed intermittently, and when they do form, they’re larger than would be predicted by the calculated chip loads. The difference between the volume of chips formed by “normal” milling operations and micro-milling can be as high as 9x for micro-milling and is typically on the order of 2-3x. Compounding the problem of higher cutting forces is that the micro-machining cutters themselves are small and less able to resist tool deflection. They’re more delicate and more likely to break in the face of deflection, higher chip loads relative to their size, and higher cutting forces. Our G-Wizard feeds and speeds software takes all this into account, and is well-suited to providing feeds and speeds for your tiny cutters. G-Wizard will automatically switch to appropriate micromachining algorithms as your cutter diameter drops. If you haven’t tried G-Wizard, and especially if you plan to do any micro-milling, take a moment to join the free 30-day trial. What’s Required for Micro-Machining Success? 1. 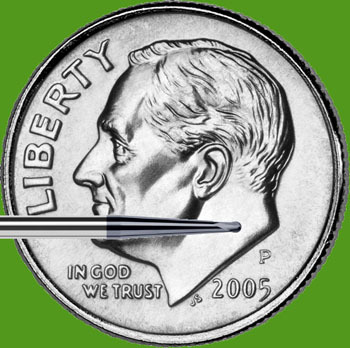 Accuracy: As described, micro-machining begins with features around 0.001″ in size and this requires accuracies in the 0.0001″ range. 2. 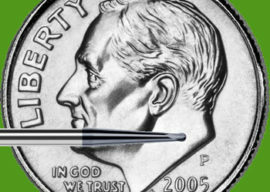 Minimal Runout: Makino suggests that runout is the #1 issue for tool life when micromachining. In some ways, runout is akin to accuracy–it means placing each cutting flute exactly where it needs to be along the spindles rotating axis. Runout causes some flutes to do more work than others, and it can make a flute take a deeper cut than expected. That’s tough on fragile micro-cutters that already tolerate very little chip load. We’ve written an entire article to help you measure and correct spindle runout. 3. Care for Deflection and Cutting Forces: Small tools deflect much more easily and the forces involved are 2-20 times greater than conventional machining models would predict. Always use the shortest possible tool to maximize rigidity. Toolpaths may need to combine roughing and finishing as the feature may be too thin for separate roughing and finishing paths. Here’s a great article to help you manage tool deflection. 4. Care for Chiploads and Feedrates: Once the cutting edge radius is the same as the chip load, the actual rake of the cutter is irrelevant and it behaves as a negative rake cutter. There is a very narrow range of acceptible chip loads before tool life and outright breakage become a problem. 5. High Spindle RPMS to allow reasonable feedrates within the limitations of the chip loads micro-cutters can tolerate. Given that chip loads are baked in by cutter geometry considerations at the micro-scale, the only way to increase machine speeds is to use high spindle rpms to allow reasonable feedrates within the chip load limitations micro-cutters can tolerate. 7. Inspection. For the most part, you’ll have a hard time using a micrometer to accurately measure these tiny parts by hand. Shops interested in micromachining will need to make some capital investments in improved inspection capabilities. That means toolmaker’s microscopes and often machine vision systems. Lasers and 3D touch probes can play a role, but when micromachining, the parts may be too small for them. Our Definitive Guide to Metrology walks you through many of these measuring instruments. Over time certain questions and queries start to stand out, and the most prevalent questions we hear a lot about is that machinists are breaking their delicate micro-mills and other tiny cutters too often, and they’d like some pointers on how to avoid it. Micro-mills are certainly more delicate than normal endmills, but as mentioned, they also operate under different conditions. There are four key issues that lead to greater likelihood of breakage of micro-mills. Let’s consider each one in turn. – Spindle runout at actual rpm. This is measured against the spindle taper. 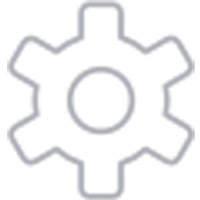 – Flute runout relative to the shank. The tool grinder may not have made the flutes perfectly symmetrical and concentric to the shank. It is common to find tools whose flutes have 0.010 mm (0.0004″) or more of runout relative to the tool shank. All of those sources of runout stack up, and you need to think of runout as being additive to chip load. Delicate micro-cutters are already very stingy about how much chip load they can tolerate. To keep runout from becoming the limiting factor, it needs to be kept to no more than 10% of the cutter’s diameter. The smaller the cutter, the harder it is to hit that ideal. For an 0.010″ cutter, we need the total runout to be less than a thousandth of an inch. Not too much to expect. But when we start using cutters 1/10 that size, runout from all sources must be less than a tenth. That’s very demanding! Because of the relationship of chip thickness to cutter edge radius, micro-mills require more energy than normal endmills relative to their Material Removal Rate. It’s as if the material is actually harder for the micro-mill than it would be for a regular mill. Cutting forces are larger, as much as 2X according to one source, and the little cutter can exceed its bending limit. This is a good reason to keep tool deflection within limits by using a calculator that does tool deflection calculations like G-Wizard. Micro-mills are much more susceptible to breakage due to chip clogging. The available space for chips between flutes is smaller, and the clogging tends to happen much more suddenly. For that reason, some machinists will prefer to use HSS cutters which can bend more than carbide without breaking. If the chips do clog, the cutter is likely to break within relatively few rotations. For harder materials, machinists will also prefer 2 flute micro-mills, even in materials such as steel where they’re used to having 4 or more flutes in conventional milling. The reason is that micro-milling produces a larger volume of chips than conventional milling and fewer flutes provides larger gullet space. But there’s a trade-off. WIth more flutes, you can be sure there is always a flute in the cut, which reduces the “hammering” vibration machinists associate with fly cutters. Built up edge (BUE) is much more likely on a micro-cutter. It too leads to more force being required, which leads to more deflection, which leads to breakage. The answer here is to use shallower depths of cut and smaller stepovers, along with ensuring proper lubrication from mist or flood (mist is often preferred for micromachining) is available. Given that set of concerns, let’s take a look at how to minimize micro-mill breakage with these tips. First thing is first, you need to have proper feeds and speeds for these cutters. As mentioned, our G-Wizard feeds and speeds software takes all this into account, and is well-suited to providing feeds and speeds for your tiny cutters. Inexpensive machines typically have more spindle runout than higher-end CNC’s. Runout is a real problem when micro-milling because you should think of runout as a % of the cutter’s diameter. Hence a small cutter tolerates very little runout, and the smaller the cutter, the less runout that can be tolerated. Remembering the sources of runout (spindle, toolholder, and relationship of flutes to shank), the total runout stack up must be less than 10% of cutter diameter for best results. Even very expensive CNC machines can wind up with excessive runout for micromachining applications as bearings start to fail. Runout can also be made worse by your tool holder. I had a brand new ER32 collet one time that turned out to be bad. It looked perfect, but I was breaking small cutters in it right and left. I was convinced my cheap collet chuck was at fault, but I eventually tracked it down to a brand new collet. Replacing it immediately improved my results. It’s pretty hard to accurately measure your runout on tiny endmills, but it is important to keep this source of trouble in mind. In fact, it gets worse, especially for really small cutters. High quality ER collets are only good for 0.010 mm runout. You can do better with UP-style collets, and take runout down to 0.005 mm. But that can still be too much. You’ll need ultra-precision collet systems designed for micromachining to get down to 0.001 mm or less. Just measuring your runout in a micromachining setup is hard too. A DTI, even a tenths indicator, is not accurate enough. The top experts in the field will hire a specialist to come in and check using laser or capacitive resistance technology. One last thought on runout. I mentioned it is too much chip load that breaks cutters. Runout places most of the work on just a few or even one flute depending on how the flute is oriented relative to the direction of the runout. Hence, a lot of runout, as a % of tool diameter, is increasing your chip load by that same %. If you’re already close to the “edge”, you’ll break the cutter just as surely as dialing up more chip load by any other means would. In micro-milling it’s very important to keep the chips clear. I always cringe when I see a picture with a lot of chips piled around the cutter. Recutting the chips and trying to force the new chips past the pile of old ones is really hard work on your poor old cutter and micro-cutters are even less capable of doing the job. Avoid driving them into deep slots and pockets except with absolutely minimal cut depth and stepover per pass. Flood coolant is not necessarily a panacea. Really tiny cutters are happier with mist as the pressure of the flood itself can be hard on the cutter. In addition, too little flow or poorly aimed flow can sometimes allow chips to pile up even with a good flood system. If you train yourself to be paranoid about chips in the cutting area, you’ll immediately see benefits in cutter life and surface finish. Note that if your cutters are particularly small, you have reached the point of diminishing returns or even damage with flood coolant because the force of the flood can deflect the tools and workpiece. Try a mist system, and use as low a viscosity cooling fluid as you can with it. Some, like Datron, are even using alcohol for micro-machining coolant. Lastly, consider fewer flutes when machining harder materials. They have a larger gullet area that gives more room to evacuate the chips. Chips made from hard material can damage a micro-cutter very quickly. 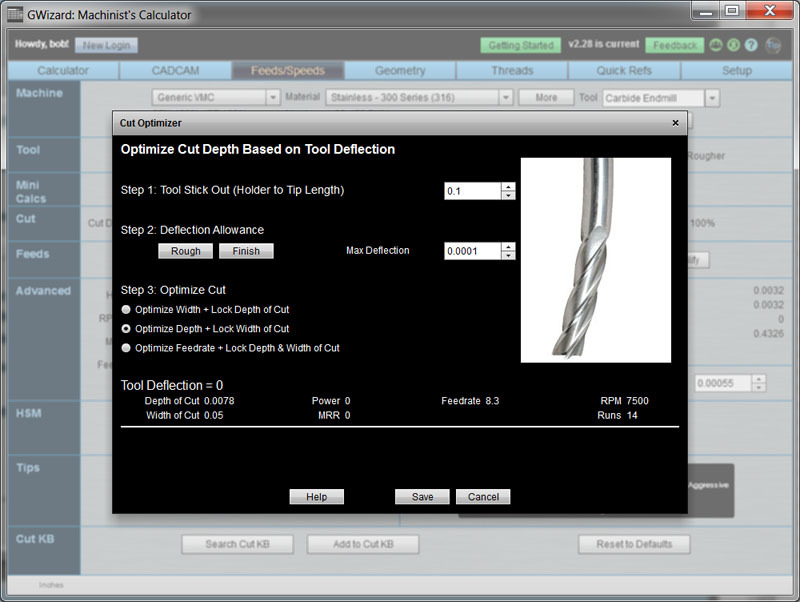 G-Wizard lets you calculate your deflection and even optimize cuts to hold to deflection limits. Deflection is just like runout for small cutters, and it becomes easy to forget about having too much tool stickout because the darned things are so small it seems like only a small amount protrudes. deflection is far more prevalent in micromachining applications. Chatter is tough on any tool, but it can be instant death to micro-cutters. Worse, you won’t be able to hear it in micro-applications–it’s just not loud enough. Chatter is a function of rigidity, which resists deflection and a tendency to vibrate and excite chatter, and resonance. A given tooling combination on a given machine will have certain resonant frequencies where chatter occurs. Your task is to avoid them. See our chapter on chatter for more about that. In addition, look for tool geometries that minimize chatter such as variable helix angles, rake angles, and flute spacing. These variations ensure that each cutting edge is creating vibrations at different frequencies. When they’re all the same, the vibrations will tend to amplify one another making chatter much more likely. Vibration is also a problem. Some shops will put out a notice during critical micromachining operations asking operators not to do heavy roughing on other jobs. 5. Keep your setup and workholding as rigid as possible. Here again, we’re trying to minimize chatter. A close corrollary is to choose your order of operations so as to keep as much rigidity in the part as possible early in the machining process. 6. Don’t “baby” the cutter on chip load lest you be cutting so little that the cutter is rubbing instead of cutting. 7. 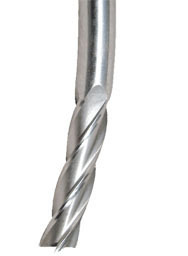 Use tools with an odd number of teeth, such as a 3 flute endmill. They deliver less vibration and more chip clearance. 8. Consider HSS tools instead of carbide–they’re less brittle and can “flex” a little more. These toolpaths, such as Trochoidal Machining, are focused on creating constant cutting forces throughout the toolpath. This makes them a lot gentler on delicate micro-cutters. When micro-turning, you will need to be able to set your tool’s Y (height) much more accurately than for conventional turning. Some applications may require the ability to adjust within 1 or 2 tenths. Plan ahead how you’ll get the tool positioned that accurately relative to your spindle’s centerline. When creating square-edged micro slots, start roughing with a ball end then finish with a square edged cutter. This minimizes load on the square edged cutter. We’re all familiar with how a radius on the edge of a square endmill (often called a bullnose cutter) can increase tool life. This is the micromachining analog. At micro-scale, you need the much bigger radius of a ballnose to make a difference. 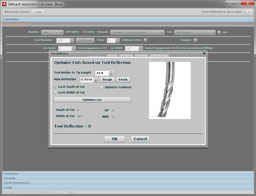 First and foremost, make sure CADCAM Software resolution settings are up to the task. The default resolution settings on most CAD and CAM software work great for typical machining tasks, but they may not be precise enough to work well when micromachining tiny features. You’ll need to move to as much as 5 digits of precision for best results, depending on how small your parts are. Unfortunately, requiring the higher position will make the software run much more slowly, and it can produce much larger g-code programs. 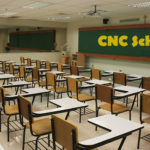 You may need more powerful workstations to run the software on and you may need more memory on your CNC Machines or a drip feeding system to cope with the larger program sizes. – Adjust the mesh size, accuracy, and resolution of your CAD and CAM to deal with the very small features found in micro-machining. CADCAM translation problems are a high risk due to these precision issues. – Cutter Entry and Exit are especially important to tool life. Be aware of strategies that allow your cutter to gracefully enter the material with minimum shock and stress. See our toolpath considerations chapter for more on this. – Rest Machining strategies are valuable as clean up toolpaths are often a requirement when micro-machining. Given the extreme taper of micro-milling tooling, the CAM package needs to use its Rest Machining to avoid collisions with the workpiece and the tool shank on successive passes. 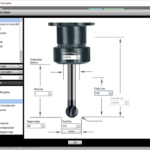 Make sure your CAM software’s Rest Machining is computed to a sufficient degree of accuracy. – There are a lot of similarities between high speed machining (HSM) and micro-machining. For example, the need to avoid sharp tool motions which is often accomplished by rounded entries to corners. However, rounding can become a challenge in micro‐milling, which commonly features very small stepovers. 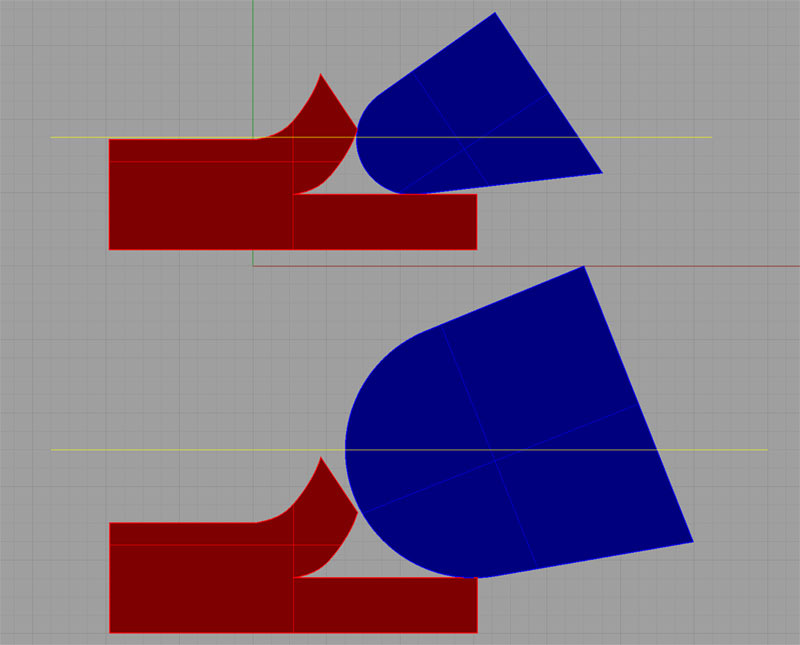 Rounding smaller than the stepover will likely create a sharp motion, while rounded corners larger than the stepover could create ridges and gaps between sequential passes and generate excessive scallops. Specialized toolpaths exist to ensure high surface quality and to prevent such gaps and ridges. These include CBP (Clean Between Passes), CBL (Clean Between Layers), and Ridge Machining. – Effective rest machining at a resolution commensurate with micro-machining is critical. Rest machining allows clean up tool paths as well as a knowledge of exactly how much material is being removed at every point in the toolpath so that feeds and speeds can be optimally varied along the toolpath. Typically, you’ll want higher rpms for micromachining, if only to achieve faster feedrates to get the job done sooner and to get better surface finish (yet another tolerance that is often much tighter when micromachining). – You can drill holes as small as 0.005″ with a 10,000 rpm spindle as long as you minimize runout and vibration. – A 15,000 rpm spindle is good for micromachining with tools down to 0.03125″ in diameter. Smaller diameters will require more to achieve reasonable feedrates and surface finish. If your machine’s spindle isn’t capable of these rpms, consider a secondary auxilliary spindle before you try to replace the machine. While spot drilling in conventional machining is needed less often than many expect, you will reduce breakage of micro-drills by spotting a seated diameter 5% larger than the drill bit diameter. Sharp is a relative term. For tiny microcutters, they are never sharp enough. That means you’ll have to work overtime to keep from making things worse. Replace at the first sign they’re losing their edge. Make sure the edges of microcutters don’t come into contact with other microcutters in storage. There are a variety of arguments for this but the primary issue is one of which way the tool deflects. Since micro-mills are particularly susceptible to deflection, a conventional milling approach is preferred since deflection will be along the tool path and not into the workpiece. Deflection into the workpiece leads to increased chip load and inaccuracy as well as encouraging chatter if the workpiece is very thin. For more, try our Climb vs Conventional Milling page. Sometimes when micro-machining, the wall that’s left after roughing will be so thin that it can’t support itself for a further finishing pass. The result is workpiece chatter and very unsatisfactory results. Consider combining the roughing and finish operations in a single pass for these cases. G-Wizard was built with micromachining in mind. It uses different algorithms to compute feeds and speeds when cutter diameters go below 0.125″. Just as importantly, G-WIzard has a plethora of tools to help in managing tool deflection, which is critical for micromachining applications. The key thing to keep in mind is that tool stickout is measured from the top of the cutter-diameter section to the tip, and should not include the much larger tapered shank. From the standpoint of the micro-mill, that tapered shank is so much larger than the cutting portion that its rigidity is not in question. When you buy your micro-mills, look for stub lengths of this section. Keep it as short as possible. 3 x the cutting diameter is a good basis though much longer cutters are available. Resist the temptation to stock up on the longer cutters unless your job specifically calls for it because they’re so much less rigid. 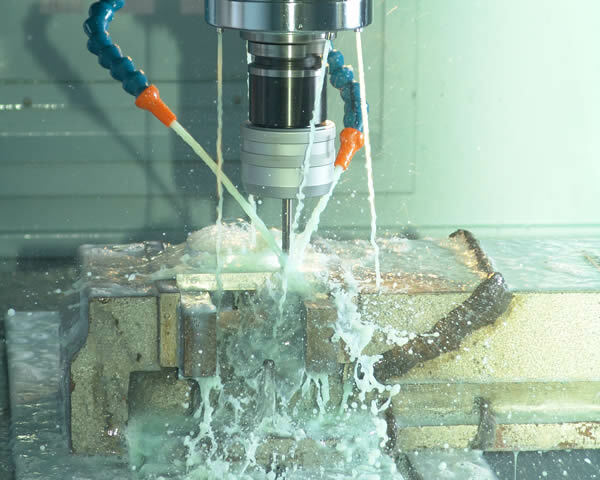 CAD/CAM Considerations for Micro-Milling: MMSOnlineUltra-Cool: Coolant considerations when micro-machining. 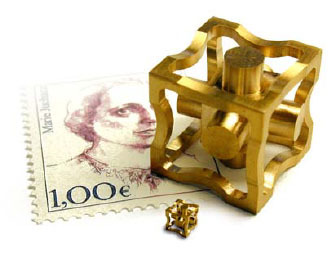 Building a Low-Cost Micro-Milling Machine: Interesting academic paper.